Take the fast track to that vast, frost-bitten wilderness at the South Pole. 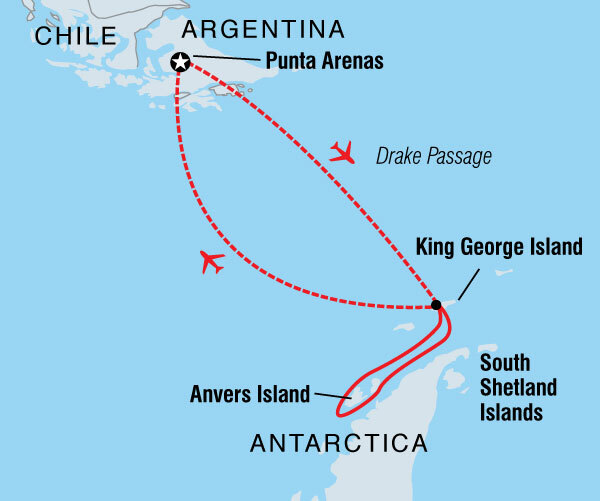 From Punta Arenas, fly over the infamously choppy waters of the Drake Passage to King George Island, and hop aboard a ship bound for the frozen wonderland. Cruise between towering icebergs floating in iridescent blue seas, and feel the thrill of catching the first glimpses of Antarctica’s icy shoreline. Over the next four days, explore this continent blanketed with snow and ice – perhaps learning about the fascinating geology and history of the region from expert guides, spot whales and seals cavorting in the Southern Ocean or make friends with penguins on windswept beaches. No two expeditions are the same, but the magic of Antarctica will infect all those adventurous enough to travel to the end of the earth. 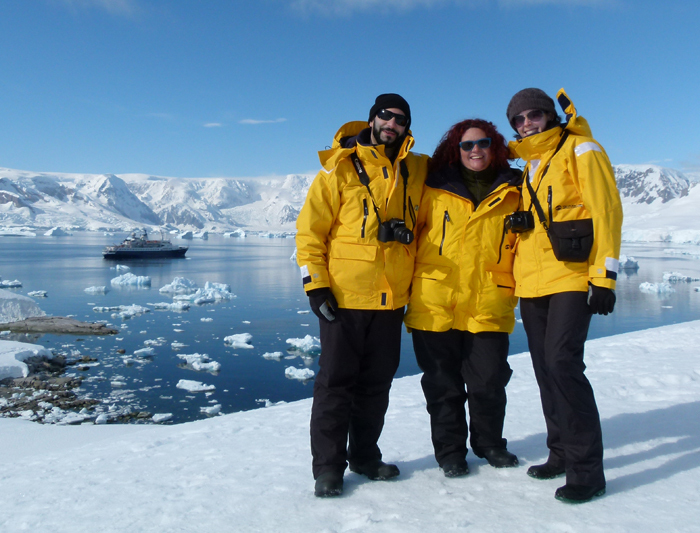 As the ship approaches the White Continent, your captain and expedition team keep their eyes open for possible whale and seabird sightings. Over the next four days, the team of specialist lecturers aboard the ship will provide in-depth explanations of the geology, history and wildlife of the region. Your first Zodiac landing may see you walk on a beach teeming with thousands of penguins and seals, which is one of the most intimate ways to experience the unique wildlife of Antarctica. Landings are dependent on weather, but every day presents new sightings, activities and photo opportunities. It won’t be long before you can tell the difference between an Adelie, gentoo or chinstrap penguin. You may take a Zodiac cruise in search of whales around Pleneau Island one day, followed by a hike to a penguin rookery the next. The expedition team will provide insight into all of the places you visit. POSSIBLE LANDINGS AND WILDLIFE SIGHTINGS: CUVERVILLE ISLAND A gentoo penguin rookery is situated on the north end of the island on a rocky beach. Depending on the time of season you visit, you may see them building nests or attending to their chicks. Giant petrels and kelp gulls also breed on the island. DAMOY POINT If you're lucky enough to mail a postcard in Antarctica, you’ll likely pass through Damoy Point. This is the northern entrance to the harbour on which Port Lockroy is located. DANCO ISLAND This small island, 1.6 km (one mile) in length, is easy to explore and home to gentoo penguins. Visit the marker of a former British Antarctic Survey hut and watch out for a variety of seabirds such as snowy sheathbills, kelp gulls and blue-eyed shags. ENTERPRISE ISLAND Located in Wilhelmina Bay, this island was once used by whalers. A Zodiac cruise around the island passes by a wrecked whaling ship. LEMAIRE CHANNEL This strait runs between Booth Island and the Antarctic Peninsula, and is one of the most scenic locations on the western coast, especially during sunrise and sunset. The 11 km (6.8 mile) channel may become impassable when ice fills the narrow passageway, so we’ll hope for clear waters. MELCHIOR ISLANDS This is a group of low islands in Dallmann Bay, on which you may see male fur seals haul-out at the end of the breeding season to recuperate from their battles for supremacy. NEKO HARBOUR This bay was once used by the floating whale factory ship Neko. You may see some whale vertebrae used by resident gentoo penguins as shelter from the wind. There's an unmanned refuge hut here, erected by Argentina. Climb past the hut and up a steep slope for spectacular views of the glacier-rimmed harbour. PETERMANN ISLAND Here, near the Lemaire Channel, you can stand ashore and see the southernmost breeding colony of gentoo penguins. Adelie penguins, shags and south polar skuas also inhabit the island. The dome of the island rises 200 meters (650 feet) above the sea, offering a challenging hike for panoramic views. PORT LOCKROY Journey to Port Lockroy if weather permits. The harbour is on the west side of Wiencke Island. A secret base was built here during the Second World War as part of Operation Tabarin. It's now designated as a historic site, featuring a museum and the world's southernmost post office. Proceeds from your purchases here support the preservation of historic sites from the Heroic Age of Exploration. WATERBOAT POINT At low tide this historic point is connected to the Antarctic mainland. Zodiacs can be used to explore the area when the tide is in. Two scientists studying penguin behaviour lived in a water boat on the point from 1921-22. The remains of their camp have been designated as an Antarctic historic site. AITCHO ISLANDS This is a group of small islands, some still unnamed, situated in the northern entrance of the English Strait. 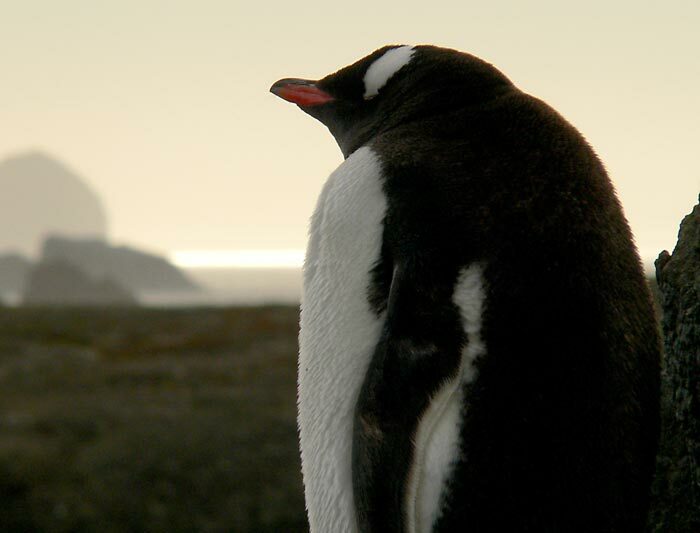 You can often spot a great mix of wildlife here, including at the established rookeries of gentoo and chinstrap penguins. Southern elephant and fur seals are frequently hauled-out here too. BAILY HEAD Also known as Rancho Point, this area is a rocky headland on the southeastern shore of Deception Island. Chinstrap penguins build nests on slopes leading to a high ridge, which dominates a natural amphitheater and provides a superb setting for landscape photography. HALF MOON ISLAND This crescent-shaped island was known to sealers as early as 1821. Unlike the sealers who liked to keep their best locations secret, we’re happy to bring you ashore on this impressive island. Many Antarctic birds breed here, including chinstrap penguins, shags, Wilson’s storm-petrels, kelp gulls, snowy sheathbills, Antarctic terns and skua. HANNAH POINT Macaroni, chinstrap and gentoo penguin rookeries are located on the point, which is on the south coast of Livingston Island. Due to the rather congested area available to the nesting penguins, you can only visit here from 10 January onwards. PENDULUM COVE Hot geothermal waters are found along the shoreline of this cove, which was named after observations made in 1829 by a British expedition. You may see yellow algae and boiled krill floating on the surface because of the scalding hot water. PENGUIN ISLAND Antarctica has two flowering plants, both of which you can find on Penguin Island: Deschampsia antarctica and Colobanthus quitensis. Chinstrap penguins, fur seals and southern elephant seals use the island for breeding purposes. ROBERT POINT A nice spot for Zodiac cruising, this point was known to sealers as early as 1820. Chinstrap penguins, kelp gulls and pintado breed here, and whales may be seen in the surrounding waters. TELEFON BAY Your expedition team will point out where the most recent evidence of volcanic eruption on Deception Island can be seen. TURRET POINT Chinstrap and Adelie penguin rookeries are found on this point, which is situated on the south coast of King George Island. 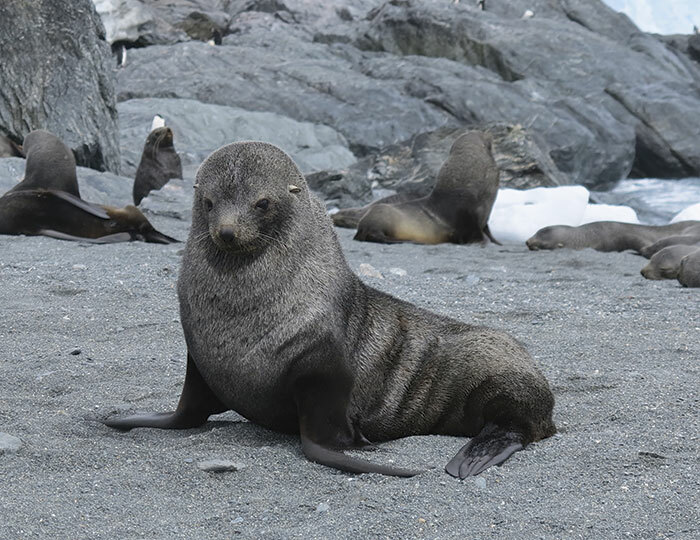 The beaches are often crowded with southern elephant, fur, and Weddell seals hauled-out on the rocks. WHALER'S BAY To reach Whaler’s Bay, sail through the narrow passage of Neptune’s Bellows. The bay was used by whalers from 1906 to 1931 and is part of a protected harbour created by a circular flooded caldera, known as Deception Island. Along with waddling penguins and lounging seals, you’ll see the rusty remains of whaling operations on the beach. Watch for steam rising from geothermally-heated springs along the shoreline. YANKEE HARBOUR Gentoo penguins have established a rookery on this harbour, which is situated on the southwest side of Greenwich Island. You can also see an abandoned Argentine refuge hut and a huge glacier stretching along the east and north sides of the bay. An abandoned try-pot is all that remains of the sealing activity that brought men thousands of miles to seek their fortune. The following Optional Activities are available to participate in, on some or all of the departures of this itinerary. These must be booked in advance (additional costs apply) and space is limited. KAYAKING – Our kayaking adventures are the best way to feel at one with the sea. Taken in small groups of maximum 16 people, multiple times per voyage, kayaking adventures are only conducted during calm weather conditions. Kayaking is open to all levels of experience, however kayaking in the polar waters is not suitable for novice kayakers. Beginners interested in kayaking should first take an introductory course prior to the voyage which includes how to do a wet exit. In addition regardless of your experience, we recommend you take part in some kayaking practise prior to the voyage to ensure that you are comfortable on the water in the icy conditions.